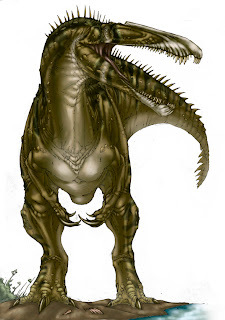 So this is an older shot of Suchomimus. As you can see I don't really like drawing backgrounds, since I don't actually get paid for doing these drawings, I tend to just concentrate on the animal. Found in Africa, this animal is considered a close relative of Baryonyx (the first good specimen of a spinosaur found.) The skeleton that was found was of a sub adult and it was 36 feet long, so this animal might have gotten to the 40+ foot size range. There are teeth from this line of spinosaurs (Spinosaurus and Irritator are on a second branch, they have less teeth and a more pterosaur like head) from Europe, weather this is a third species is unknown right now. This two draws are cool !